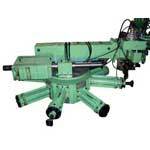 The Facing Machines manufactured by us are of high class and standard. 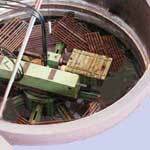 Our Pipe Facing Machines is available with double end facing for the simulations facing and centering of shaft ends. They are highly durable and user friendly of in nature. In addition to this, we are one of the prime Industrial Facing Machines Manufacturers in India. These machines are meant for insigte Milling, Turning, and grinding of large diameter ranges. The job configuration and size of the job do not permit jobs to be mounted to the machine. our equipment suitably to the job. Depending on the job hydraulic jacks or similar devices are provided to align fixed arm setup axis and the job centres with the help of screws. The position can be locked. Rotary table assembly is supported on top of the fixed arm. This assembly includes a) rotary table bottom b) rotary table top c) slew ring assembly with 3 row roller bearings, axial roller bearing with internal gear. Rotary table assembly is driven by reduction drive at the bottom and is provided with variable speed within its range using an inverter drive. A rotary arm is fixed on the top of the rotary table. 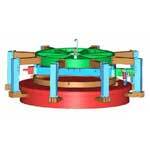 The rotary arm carryâ��s X and Y axis slide assembles and surface is also houses the spindle unit. The slide movements are CNC controlled. Wherever precision accuracy of the machine surface is called for the system of feedback to the CNC slide from a master link can be provided. Such a feed back continuously controls the deviation of the machined surface from the master to provide accurately machine flanges. 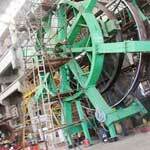 Machineries manufactured to cover different ranges of flange diameters like 2-6 meters, 6-10meters and 10-15meters.